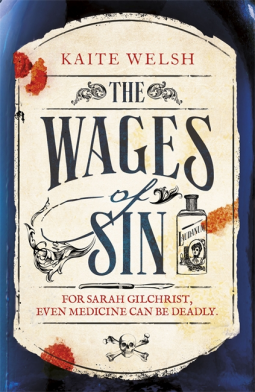 Back cover blurb: An irresistible mystery set in 1890s Edinburgh, Kaite Welsh's THE WAGES OF SIN features a female medical student-turned-detective, and will thrill fans of Sarah Waters and Antonia Hodgson. Sarah Gilchrist has fled from London to Edinburgh in disgrace and is determined to become a doctor, despite the misgivings of her family and society. As part of the University of Edinburgh's first intake of female medical students, Sarah comes up against resistance from lecturers, her male contemporaries, and - perhaps worst of all - her fellow women, who will do anything to avoid being associated with a fallen woman... When one of Sarah's patients turns up in the university dissecting room as a battered corpse, Sarah finds herself drawn into Edinburgh's dangerous underworld of bribery, brothels and body snatchers - and a confrontation with her own past. The Wages of Sin is an impressive debut, and I look forward to reading more from this author. The Wages of Sin is available now via Amazon online and all good book shops.